This is very nice. I would love to see it as an android gadget. Yes indeed, it would be nice to just give the mobile a glance to see how the day looks! Are you planning to do an Android version? I would love this as an Android widget !!!! Please make an adroid widget from this, or even integrate it into quickcalendar’s event view! I’m looking foward to see this events clock on my android home screen. any chance you could put one together that displays events in the past please ? I want to put together a schedule (i.e. 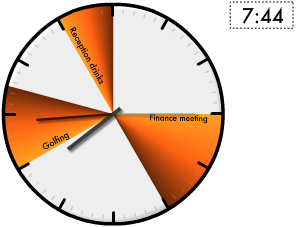 from 6-7 do this, 12-1 do this etc, and it won’t work unless I change the time etc. 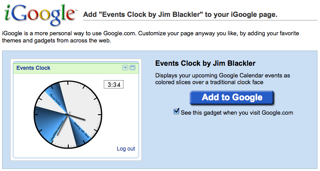 Instead of linking this to a Google account, is there a way to incorporate the Events Clock into an existing Flash website? I ask, because currently Google doesn’t have a Flash API to integrate the Google Calendar into Flash CS4 (they do however have a Google Maps Flash API, SWC component for Flash CS4) and I thought this might be a nice feature for a website so that if the user clicked on one of the Events Clock’s time slots the user could be taken to a Google webpage hosting the actual Google Calendar (showing a month). Have you thought about turning this into a Flash Component, might be a good way to make a few bucks selling it on a variety of component sites before Google actually comes out with one. PLease make this available for Android phones. Really need something like this! I love it! Look forword to the iPhone app! I would like to spend a dollar to buy it!